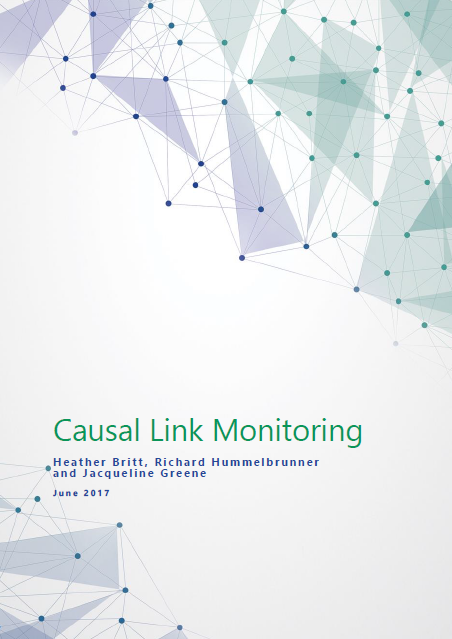 Causal Link Monitoring (CLM) integrates design and monitoring to support adaptive management of projects. CLM helps project planners and managers identify the processes that are required to achieve desired results, and then to observe whether those processes take place, and how. Result-producing processes specify the causal links between results in a logic model or results framework—in other words, the processes between results. CLM focuses on how specific individuals or organizations use one result to achieve another result. In CLM, planners start by creating a logic model to help document predictable, agreed-upon elements of the project. Next, they refine the causal links by describing the processes that will transform results at one point in the causal chain to the next. Planners are often less certain about these result-producing processes. Finally, the CLM logic model is enhanced with information about two important sources of uncertainty, contextual factors that may influence the project and diverse perspectives on the problem and its solution. Identify assumptions about causal links. Enhance the logic model with diverse perspectives and contextual factors. Interpret and use monitoring data for adaptive management. This page is a stub (a minimal version of a page). You can help expand it. Click on Contribute Content or Contact Us to suggest additional resources, share your experience using the option, or volunteer to expand the description. If you're looking for more information on this approach, for the moment, we suggest you take a look at the Recommended resource.